I’m coming off a serious downhill at the start of mile 23. A few miles earlier, a local claps for me as I turn a corner in one of the nine wards of Morgantown, West Virginia, and confirms what I’ve been thinking for awhile. Leaning forward to try to make up some time I’ve lost in the many uphills on this course, I round my way onto Route 119 for a long, flat stretch of the course, which goes through the campus of West Virginia University. And that’s where I see the third place guy. He can’t be more than 20-30 seconds ahead of me. Before this, there were too many twists and turns in the course to really get a clear read on his whereabouts. What am I going to do? I start an internal debate with myself. Do I try to hit the gas a little bit harder now, pull even with him with several miles left in the race, and hope he has nothing left to counter? Or do I hang back just enough to make him think I’m not a threat, and wait until the 150-foot elevation gain between mile 25-26 for a foot race? I can’t let this distract me for the next 20 minutes. I made the choice — hang back, and make your move on the mile 25 hill. But wait — how did I get here? Was this race even going well for me? What the heck was I doing in West Virginia? I got this question a lot when I told people I was running a marathon — the idea of running a race in West Virginia was very strange to many. 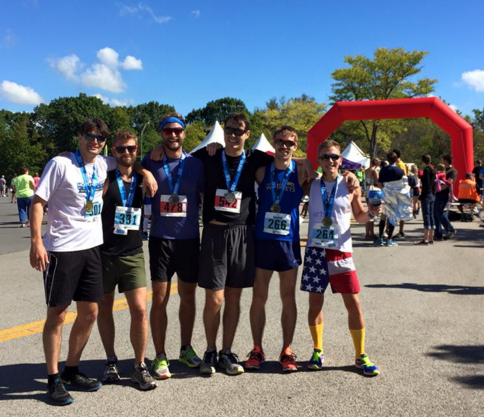 For the past couple of years, a group of my undergrad friends had picked a marathon in a non-major city for which to train and race. Past races included Nashville in 2013 and Cincinnati in 2014. After missing out on those races, I looped myself into the conversation for the 2015 edition. Our discussion began in March. We originally had our sights set on Baltimore, mainly because it was a Saturday race and we could then have time to properly celebrate that evening. But some scheduling conflicts got in the way, so we had to go back to the drawing board. 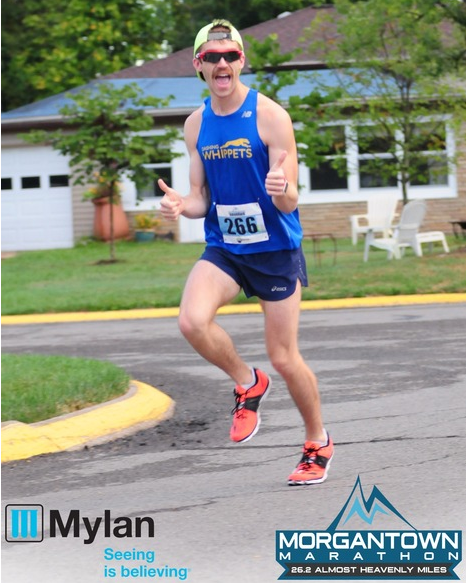 One of my friends, Ry, grew up in Morgantown and discovered that there was a brand new marathon being held in his hometown. It seemed like a no-brainer for the group — why else would we all get together in West Virginia? Plus, we had a place to stay and a local guide. We quickly agreed that this was the race for us. While this was hilarious to all of us after the race, I have to admit that my training focused on lots of mileage and strong workouts vs. drinking awful malt beverages and eating sugary snacks. I guess I was a bit lucky with the timing of the start of marathon training — I was just coming off the Brooklyn Half in late May, which was the second half I had ran since the beginning of the year. I had basically been in training for a long-distance race since January. I had a pretty good fitness base, and was motivated not to let that slip too much. After a short respite from Brooklyn, I kicked off “formal” marathon training in June. A few race calculators said my BK equivalent was around 2:45-2:50, so I targeted 2:50 as my goal time, which would give me a new PR by about seven minutes. Speed work entails workouts like 12×400, 8×600, 4×1200, etc. Strength work entails workouts like 1×6 miles, 2×3 miles, etc. The Hanson’s plan is also helpful because it will give you your paces for all of these workouts based on your marathon goal time. Takes a lot of the guesswork out of it, especially when it’s 6 a.m. and your brain is incapable of doing math. I basically stuck with the cadence described above, but I had a few areas of focus. First, I wanted to maintain my half marathon race pace (~6:00/mile) on my tempo runs. I knew there was no shot to actually run that for 26.2 miles, but I figured it would be good to at least push myself if I had the stamina/endurance. Second, I wanted to do most of my tempo runs in Central Park, where I could get used to tiring myself out on hills. Third, I swapped out a bunch of the “strength” runs for 1K repeats, mainly to tire myself out more to simulate the fatigue I’d experience on the racecourse hills. I did have one major scare. I spent a week surfing in Nicaragua in mid-August, and long days on a surfboard severely bruised my ribs. Trained medical professionals assured me that there’s nothing you can do about injured ribs except wait for them to heal. Needless to say, some of those runs right after vacation were a bit uncomfortable, but I was nearly 100 percent by race day. The East Coasters in the group all arrived late Friday evening into Pittsburgh and made the drive south to Morgantown. The rest of the crew, coming from San Francisco, arrived on Saturday afternoon. We knew that the course was hilly, but we wanted to see it for ourselves. We asked Ry, the Morgantown native, to drive the course on Saturday. This was a game-changer for me. The uphill climbs we could only once see on an elevation map now became real things with start points and end points. I made a note of the major features of the course — a major climb from mile 6-8, followed by a severe downhill to mile 10, a more gradual uphill section from mile 18-20, another climb on mile 22, and the final uphill from mile 25-26. Say hello to my not-so-little friend. Damn you, hill at mile 25! After the pre-race drive, I made that one decision you don’t want to make — I revised my goal time expectations. A 2:50 was not impossible, but it felt like it would be very difficult given I would have to average 6:30s through those hills. Instead, I told myself to focus on equal effort through the hills, and not to try anything crazy on any of the big hills past mile 20. In other words, trust your training and don’t stress over the overall time until you reach the end. Also, I decided to slow down to drink at water stations and only drink water (no Gatorade), and have GUs at the start of the race, mile 8, mile 16, and mile 22. However, for whatever reason, I convinced myself before the race that I would be able to gun it up the last hill on mile 25. The race day morning was like any other — early wake-up, bad bagels, some coffee, some water, get the start line and wait around for a bit. Luckily we had good weather in the mid-60s. The race began at the WVU Coliseum, the basketball arena for the school which sat above most of downtown. I told myself to go out feeling slow — which obviously meant that I wasn’t really taking it slow and instead was running 6:40s instead of 6:30s. We ran the first six miles of the course with the half marathoners, and much of this took part in a residential neighborhood with lots of turns. It was here that I saw my new favorite race sign: “This is a lot of effort for a free banana.” I was also convinced no less than three times that I had missed a turn and was running around this neighborhood aimlessly. Much to my relief, I found myself back on the main road for the first big hill at mile six. The hill wasn’t so bad — I kept a ~6:40 pace and knew I’d have a short break at a short flat stretch about midway up the hill. I passed a couple of people along the way, which is both encouraging (I’m feeling good!) and disconcerting (wait, am I going too fast already?). The ~250 foot uphill was immediately followed by a ~250 foot downhill from mile 9-10.5, bringing us down to the WVU campus and High St. (Morgantown’s main street). We then came to the residential neighborhood of South Park for miles 10.5-14, which was largely flat with some decent downhills. One spectator saw my DWRT singlet and yelled at me, “Whippets! We have one of those!” I had to smile. Miles 14-17.5 had a nice long flat stretch divided between a scenic bike path next to a creek and large road lined with fast food chains and gas stations. I wasn’t feeling too fatigued, so I settled into a 6:25 pace as a hedge against any time I had, or was expecting to lose, on climbing hills. Which was good, because three stretches of hills really cut into my times after mile 17.5. I swung between 6:30ish on the flat/downhill pieces, and 6:50-7:00s for the uphill pieces. The worst was between mile 21-22, where ~200 feet of elevation gain cut me down to a 7:00 pace for the mile. While I knew this was coming up (thanks to the pre-race drive of the course), this hill still seemed to come out of nowhere. Some Bernie Sanders supporters wanted to spray me with a hose on this hill, which I thought was strange, but I could appreciate their zeal for liberal politics and hydration. Which brought me to the big downhill at the beginning of mile 23 that I mentioned at the top of this recap. At this point, I was pretty happy with how things had gone. I didn’t feel like I had hit the wall, and felt that I had stuck to my expectations that I set throughout training. But things change a bit when you shift from racing against the clock to possibly racing against another person. When I saw the third-place runner, I felt like I had to come up with a plan to catch him. I was slowing down a bit at this point — I averaged 6:50s on mile 23 and 24. But I still held onto the notion that I could gun it up the last hill at mile 25, so I planned to make my big race changing move there. We cruised through downtown Morgantown and got to the base of the hill. Here it is, let’s make it happen. I took that mile-long hill at 7:20. I had no fuel left to burn for a big push. I’m pretty sure he gained time on me. In retrospect, I should have tried a more gradual push and not waited to outkick someone in the final mile of a marathon. I came into the finish line back at the Coliseum at 2:53:09 — a new PR by nearly four minutes. I BQ’d for the 2017 race. I came in fourth place in a marathon. I felt like I had trained well, had a strong base, and made realistic adjustments to my race strategy. I didn’t hit the wall. I got to run a marathon with my good friends. Was I thrilled? You betcha. I was only bummed not to win the trophy that went to the first, second, and third place finishers — a hand-painted goblet with the Morgantown Marathon logo. Maybe next time. The crew after the race. The champion, Greg, is on the far right, holding his 1st place goblet.